This nut-free Romesco sauce takes a slight spin on the traditional sauce with almonds, using hemp seeds instead. 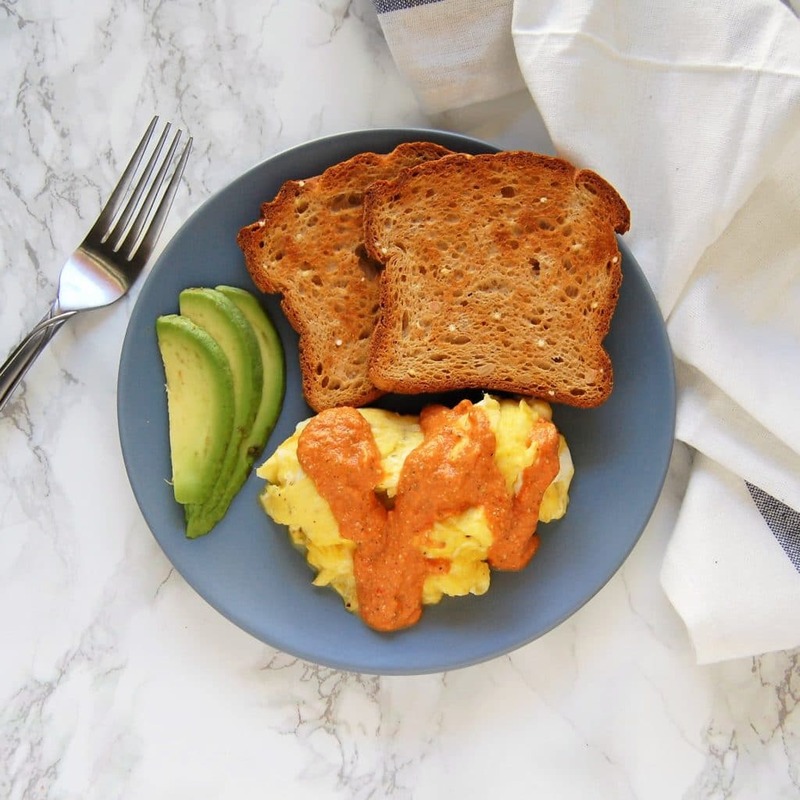 What is romesco sauce and why is this version so special? 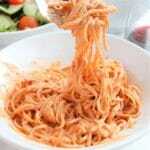 Romesco sauce is a red pepper based sauce that hails from Spain. Someone once told me Romesco sauce was created to be used with all the beautiful fish caught and enjoyed in Spain; I have no idea if that’s true or not, but I do know that this nut-free Romesco sauce is a truly delicious and versatile sauce! So why is this a nut-free romesco sauce? 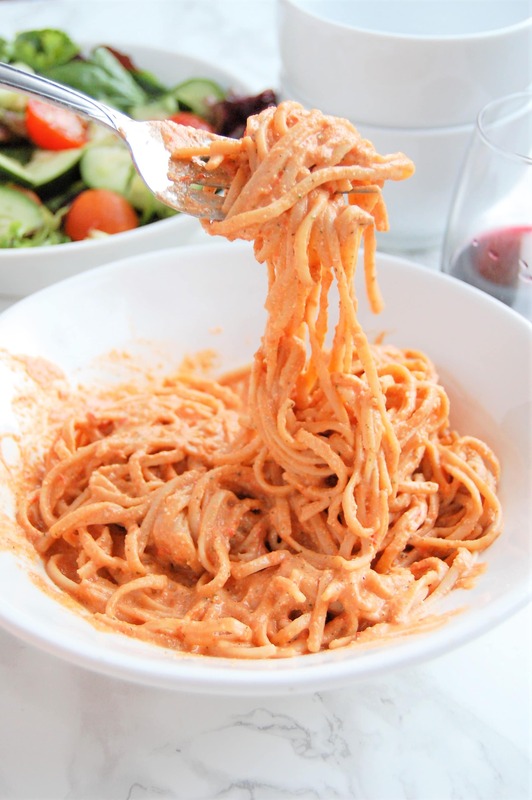 Traditionally, Romesco sauce is thickened by blending toasted almonds and sometimes some bread into the sauce. 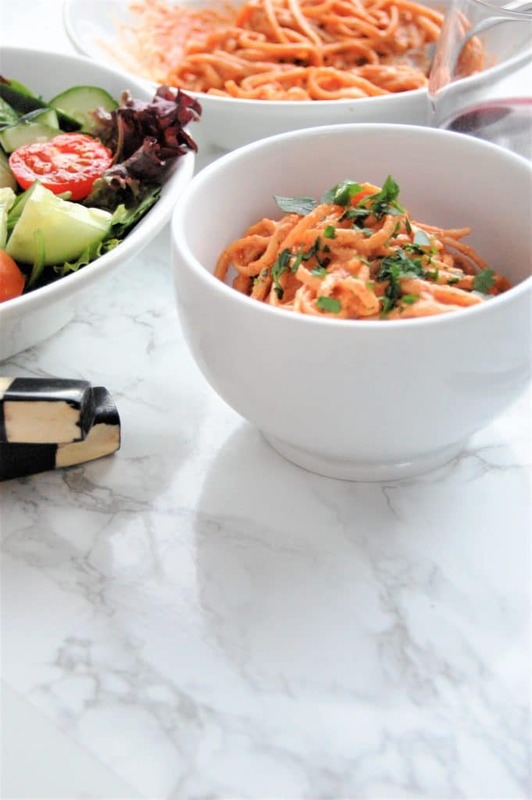 I wanted to keep this sauce as simple as possible, but I also wanted to make it something for anyone else who also has a lot of food sensitivities or allergies they manage. No bread is used to thicken this sauce at all, and neither are nuts of any kind. What is used in place of nuts is hemp seeds. As someone who is highly allergic to tree nuts (although almonds are a nut I can consume), I often rely on seeds like hemp seeds, chia seeds, and flax seeds, to provide some of the same health benefits. 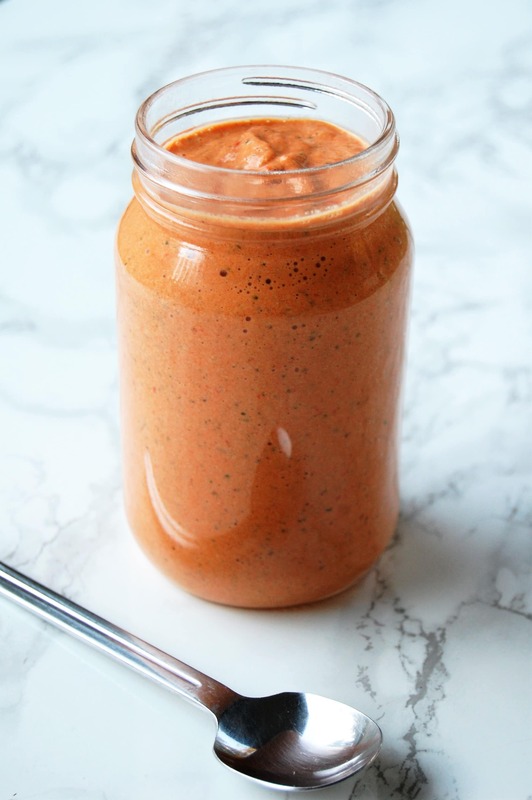 I knew hemp seeds would be the PERFECT nut substitute in this nut-free Romesco sauce! You guys know I like my simple (and versatile!) recipes, so this fits the bill. Red bell peppers and roma tomatoes are roughly chopped and roasted in the oven. The they’re transferred to a blender with the remaining ingredients and blended until smooth! 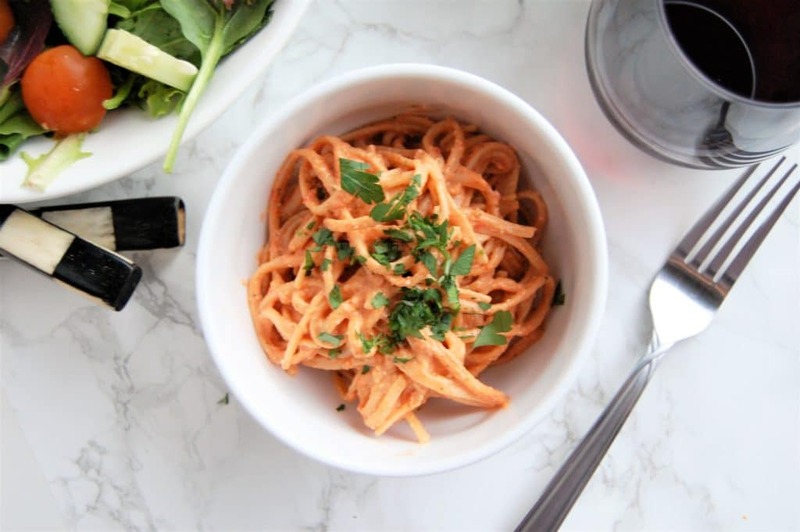 The addition of hemp seeds definitely makes this nut-free Romesco sauce creamy and satisfying, but also packed with nutrition. How to use this sauce? It pairs beautifully with pasta (I used Banza chickpea linguini here, talk about a plant protein-packed meal!) and we’ve also enjoyed it on eggs, sandwiches, chicken, fish, and more. You could even use it as a dressing on salads (perhaps thinned down slightly!). It can also be frozen up to 1-2 months if needed. If you give this nut-free Romesco sauce a try, be sure to let me know how you liked it! You can share on the NTF Facebook page or on Instagram (tag me at @nutitiontofit or #nutritiontofit). I hope you enjoy it as much as we do! Be well! Chop bell peppers and roma tomatoes in rough pieces (remove stems and seeds from peppers). Drizzle with 1 tbsp olive oil and a pinch of salt and roast in a 400 degree oven 25-30 minutes. In a blender, combine the roasted peppers and tomatoes, hemp seeds, parsley, garlic, lemon, and remaining 1 tbsp of olive oil. Blend until a smooth puree. Add salt to taste. Serve immediately or store up to one week in an airtight refrigerated container, or in a freezer up to 1-2 months.